Due to time constraints, I needed the help of Amica Paige (www.amicatonic.blogspot.com) for this great book. Enjoy! This review would have gone out sooner, but, you see, there was the case of the holidays.… And one is the wiser for not taking it in stride, unless one delighted in guilt-tossing, drama, excommunication and loved ones. Honestly, though, I would rather toss myself in bed—which, now that I think about it, might have been what actually held me. But this isn’t about me. What can I say, but, being that this is the first edition of Sherlock I have ever laid my hands (and eyes) on, quite literally—I have only a vague notion of the scope of the ever-expanding Holmesian world, further shaped by the very fandom it created, which has spawned countless adaptations all across the media, chief among them being the current hit BBC series? Why anything I should say make a “pennyworth of difference” to Sherlock devotees who, I imagine, own attics full of treasures, if not libraries, on the “unofficial consulting detective” that could topple even the most impressive “mind palace” like Magnussen’s? Regardless, I must admit: this is a celebration for committed followers and new admirers (I’m in) of the arguably (in)famous, invincible, enigmatic, evasive, eccentric genius of a sleuth—if slightly, no, precisely off-the-center and obsessive-to-the-point-of-psychotic, and rightfully so: after all, it is a “high-functioning sociopath” we follow, isn't it? But what to tame the beast of Baker Street and his exacting spirit that he does not self-destruct without our consent? Well, that calls for a different sort of strength, if a complementary and not necessarily an equivalent, opposing force, embodied in the gentle(r), steady(ier) mien of the ex-army captain, Dr. John Watson, who is no stranger himself to frailties and danger. Deferential in manner (out of high regard for his companion), the doctor’s power of observation is no less sharp. Of his early assessments of Holmes, he asserts: “[His] smallest actions [are] all directed towards some definite and practical end.” (“A Study in Scarlet” 21) Which may very well be the case in our world, let alone the sleuthing world, since “there is nothing so [sic] unnatural as the commonplace” (“A Case of Identity” 208)—lest we be left totally bereft of meaning, which, fortunately, isn’t the case the last time you (and I) checked(? ), I’m assuming; and which brings to mind a simple notion: that we all need someone to look after, who watches over us for a sane balance, and if for nothing else but the sake and “science of deduction”—no? But let’s save all my guesswork for another time. 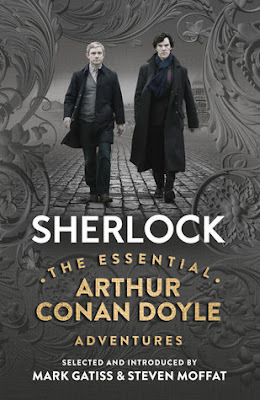 SHERLOCK The Essential Arthur Conan Doyle Adventures should make a happy addition to the fandom and an excellent starter edition for more mature readers of all ages. I only wish that co-creators Mark Gatiss and Steven Moffat (considering their seeming dedication to the Conan Doyle canon and their level of involvement in the BBC adaptation) had written a more substantial piece for each selected title, instead of pitching in a few phrases, which seems somewhat inadequate in presenting such masterpieces, but that’s just me. Nonetheless, the Victorian cover is no small treat, featuring Martin Freeman and Benedict Cumberbatch as the partners-in-crime in the BBC series—now, if that isn’t awesome as whipped icing on a cake! But the book’s true value, of course, lies in its content: Doyle’s detective tales—all 19 of them—including the first ever Sherlock adventure, “A Study in Scarlet”; the least adapted “A Case of Identity”; and the ever famous, “The Hound of the Baskervilles.” The legendary author’s prolific work spans sci-fi, romance, poetry, plays, and crime fiction, the latter of which had earned him his rightful place on the literary stage. Like his fictional character Watson, Doyle was a doctor, which served instrumental to his writing: he wrote as he waited for patients. Interesting point. Only I’m not so sure it works, especially at family gatherings…. Though we might get away with texting. Not to drown you in more asides, well, maybe just a little—especially those of you who haven't read the book (nor watched the series), which I find rather shameful if you claim to be a lover of clever characters; though it is also quite a relief to know there are worse readers than me who are slower to jump in the bandwagon, whatever their reason. Blame the “most unimpeachable Christmas goose….” Or, in my case, the Tofurky that flapped its distracted wings from one holiday to the next, not realizing, again, that it is holiday in itself when one immerses in a really good story. This is in no way a disregard of the sometimes-amusing-if-not-awkward-or-all-out-disturbing tales shared at the dinner table, where one might just catch a carbuncle, and blue at that…. Which is why one still puts up with family traditions. Having tossed enough nods to the book, I leave you with the following excerpts from one of my favorite episodes in the series instead. Loosely adapted from the original tale, “His Last Bow,” which unfortunately didn’t make it in the set (and which I haven’t read yet), “His Last Vow” is the most festive (beside the “The Adventure of The Blue Carbuncle”), though I have not the time to prove my case. Meanwhile, here's to Holmes! And to Watson, who I (we) can only wish to forever remain the intrepid chronicler of their everlasting (mis)adventures! Again, we can always hope, plus it’s the New Year and Season 4 is up! So, delay no more and be a hound like Holmes! Just don’t hound the turkeys, as did the hound of the Baskervilles…. Happy sleuthing! Let me know when you’ve jumped in! Cheers! Holmes: I feel the same. Oh, you mean it's actually Christmas. Did you bring your gun as I suggested? Watson: Why would I bring my gun to your parents' house for Christmas dinner? Holmes: Is it in your coat? Mycroft: Also…your loss would break my heart. Sherlock: What the hell am I supposed to say to that? Mycroft: Yes. Perhaps there was something in the punch. Sherlock: Clearly. Go and have some more. Magnussen: Everything's available for a price. You making me an offer? Magnussen: Then what are you giving me for Christmas, Mr. Holmes? Sherlock: Oh, do your research. I'm not a hero, I'm a high-functioning sociopath. Merry Christmas! SHERLOCK The Essential Arthur Conan Doyle is published by Pegasus Books; jacket design by Two Associates with photo from Hartsford Films.